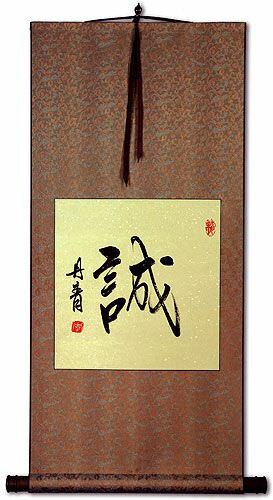 Buy a Sincere True Sincerity calligraphy wall scroll here! 至誠 is the idea that you enter into something with the utmost sincerity and fidelity. Ideas such as devotion, honesty, and "one's true heart" are also contained in this word. 至誠 is a universal word as the Chinese, Japanese Kanji, and Korean Hanja are all identical. While these two characters literally read as "true heart" or "genuine heart," the understood meaning is	sincerity, devotion, sincere, or heartfelt. Some will extend the meaning to be like, "true love." Basically, it's the idea of doing something or treating someone with genuine feelings. 真心 is valid and has the same meaning in both Chinese characters and Japanese Kanji. Note: While not too common, this can be the female given name "Mami" in Japanese. Not the results for sincere true sincerity that you were looking for? Truthful, true, truth; real; sincere, sincerity. ; See under Fourteen Strokes. Some people may refer to this entry as Sincere True Sincerity Kanji, Sincere True Sincerity Characters, Sincere True Sincerity in Mandarin Chinese, Sincere True Sincerity Characters, Sincere True Sincerity in Chinese Writing, Sincere True Sincerity in Japanese Writing, Sincere True Sincerity in Asian Writing, Sincere True Sincerity Ideograms, Chinese Sincere True Sincerity symbols, Sincere True Sincerity Hieroglyphics, Sincere True Sincerity Glyphs, Sincere True Sincerity in Chinese Letters, Sincere True Sincerity Hanzi, Sincere True Sincerity in Japanese Kanji, Sincere True Sincerity Pictograms, Sincere True Sincerity in the Chinese Written-Language, or Sincere True Sincerity in the Japanese Written-Language. 0 people have searched for Sincere True Sincerity in Chinese or Japanese in the past year.